In the spring of 2011, an MBA student named Matthew Brennan enrolled in my New Ventures & Entrepreneurship course at Plymouth State University. In that course, Matt wrote a business plan for his wife's business, Kathleen Brennan Fine Art, which is located at their home here in rural New Hampshire. 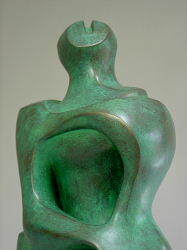 Kathleen is a versatile artist, though her most significant awards and recognition have come for her sculptures. After the course had ended, Matt and Kathleen kindly invited me to their home to see her studio. I accepted, and rode down there one day on my old 1969 BMW motorcycle. We had a wonderful lunch, and I, a fine art major at Amherst many years ago, got a huge kick out of seeing how one made bronze statues, a multistage process involving many different manual, tactile, spacial and visual talents. Last month, while Shirl was in Colorado, a group of friends and I attended the original musical production "Marking the Moment" at PSU. Each year the Educational Theater Collaborative (ETC) puts on a January musical, casting talent from local schools, high schools, and community members, as well as from the University. This tradition is now approaching twenty years old. In the past they have done popular shows for kids, such as "The Wizard of Oz." But this year they created a special show, written and scored to celebrate the 250th anniversary of the founding of the Town of Plymouth, New Hampshire, back in 1763. PSU graduate student Roxana (Roxy) Fera (din Sibiu), who is presently living with us, was a dancer and chorus member in the show, so all the resident Romanian students joined the party, as well as my Spanish professor friend Eric Cintrón, and Prof. and Mrs. Michael Fischler. Fortunately, Roxy's sister and mother were also able to attend, as were her nephew and two nieces, as that branch of the Fera/DeMaggio family is now living in New Hampshire, as well. It was a grand show! On the way out of Silver Cultural Arts Center, I stopped into the room just off the lobby where there were a number of fundraising efforts underway. The ETC is a non-profit organization, supported by ticket sales and donations from well-wishers, and from the sale of T-Shirts and the like at their event. So. I bought a $12 T-shirt, and told the ladies to keep the change from my $20 bill. "Oh, no!" one of the ladies exclaimed, let us give you eight raffle tickets, instead. I looked around the room, and put all eight of my tickets into the bucket next to this statue, which I recognized as Kathleen Brennan's work. On Tuesday of last week I received an e-mail telling me that I had won "Synthesis," by Kathleen Brennan. I am thrilled to have it here, on display at Hotel New Hampshire. Lucky? Maybe. But, I do not believe in coincidences. Thats so cool. Thanks for a great story.